In this blog post, you will read about free book barcode scanner Android apps. All you need to download the apps that I’m going to mention. Then, you can easily scan the book barcodes using the phone camera. To read the barcode, you can face the phone camera to the book barcode. Make sure that the barcode fits within the Rectangle shaped scanner. The app reads the code and then provide you details such as the title of the book, author name, metadata, etc. Also, you can compare the prices from the different websites to decide from where you should buy books. A few of these apps let you search the content on the web just with the barcode. It becomes easier to understand the book content. Thereafter, you can decide if you want to buy books or not. You can manually enter the book ISBN (International Standard Book Number) to find the books all over the web. 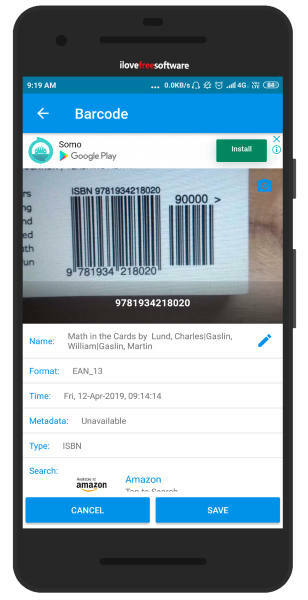 The app lets you store the multiple barcodes of the book so for the next time, you don’t need to scan the book barcode. It can be a great option for anyone who loves to read books. The students can also search book with the barcodes to get the content or price. I have also reviewed an article where you will find over 6000 literature books for children online. Let’s read about each book barcode scanner app. 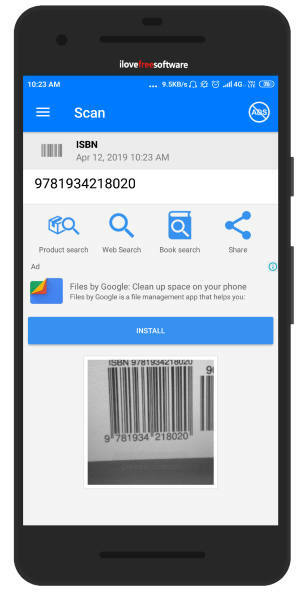 BookScouter is a free book barcode scanner Android app. 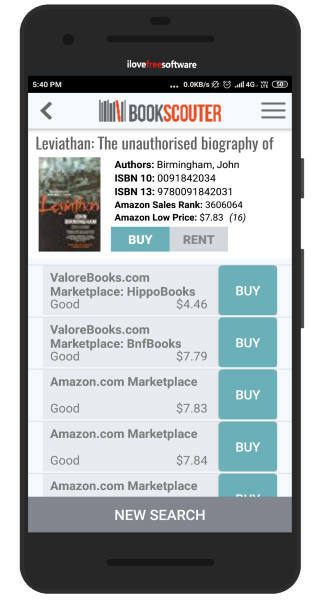 Using this app, you can sell or buy books. The app shows you real-time offers from numerous websites. Then, you can compare and decide to purchase or sell the book. When you open the app, it shows two options to search the books. You can search ISBN code to find the books or scan barcodes using the phone camera. If you want to find the book result with ISBN, then type the numbers in the search bar of ISBN and get results. The app lets you scan the barcodes using the phone camera as well. Here, you don’t need to type the ISBN number. All you need to tap on Scan barcode. And then face the phone’s camera to the barcode. The good thing about this app is that it quickly detects the barcode even when you scan the barcode image from the internet. The app shows your book result with the name of authors, ISBN number, sales rank, and low price. Then, you can decide if you want to buy it or rent it as well. SoftScan is a book barcode scanner Android app. After installing the app, you can scan the barcode of the book. You have to make sure that you face the phone camera in a way that the barcode fits in a rectangle. Right after it scans the code, the app provides you a few details. The information part includes the name of the book, format, type, metadata, time. You can edit the book name as well Apart from this, the app lets you compare the prices from different platforms. You can check prices on Amazon, Google, Alibaba, etc. Then, you can share the information. Also, you can share it via social media. The menu section stores all your saved information about the book. Barcode Scanner is another book barcode scanner app. This is a simple app that quickly scans the barcode of a book or any other product. Once you install the app, open it to read the book barcode. You have to place the book barcode inside the rectangle to scan it. Once it reads the barcode, it provides you information such as book format, time, type, metadata. Also, it provides you ISBN. It also shows the title of the book and writer name as well. Thereafter, you can search for any book online. You can read the content on the web as well. The app stores all the searches for the book. You can again open the book search without scanning the barcode. QR & Barcode Scanner is a free book barcode scanner app. The app reads the QR code and scan book and product barcode as well. When you open the app, you can face the camera to the barcode. You can turn on the flash as well. The app quickly scans the barcode of any book. Thereafter, you can search the barcode on the web. There you will see the book name, cover and other details related to the books. It is amazing that the app instantly scans the code and provide your details through the web. Similarly, you can search for products. 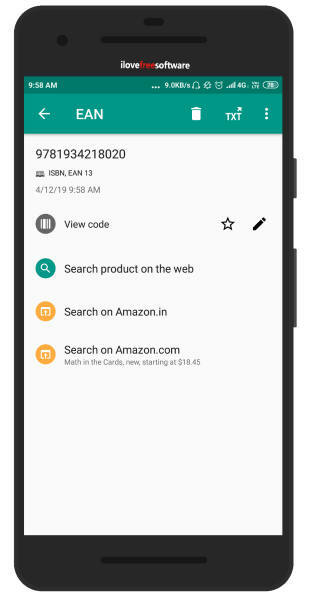 You need to scan a barcode, search it on web with the help of the app. Also, you can check the history of your book and product searches on the app. Then, you can directly search for books without scanning the barcode. QR & Barcode Reader can be a good option for scanning barcodes of the book. Once you open the app, it shows the option to scan barcode directly using the phone camera. Also, you can scan the image that has a barcode. As the above-mentioned apps, this app also scans barcodes quickly. All you need to scan the barcode within the rectangle. You can enlarge the rectangle to fit the barcode in. Also, you can zoom in/out. Thereafter, you will see the result of the barcodes. You can view the code and search book on the web. It provides you details like book cover page, author name, etc. Also, you can search the book on Amazon as well. Scanning the barcode is easy to search the products. Using the book barcode scanner apps, you can instantly search for the books on the internet. The apps also let you compare the prices from several websites. Then, you can purchase it. Also, you can read the content on the web. After that, you can decide if you want to buy the book or not.